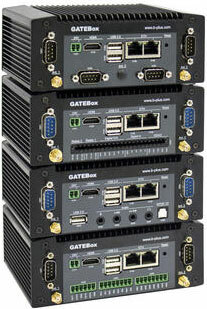 The Gatebox 100 by B-Plus (Germany) is an embedded, fan-less box PC based on a flexible interface concept. Two optional CAN interfaces are available. The requirements for communication devices are met by two Ethernet interfaces. These interfaces are suitable for the precision time protocol, to synch the time base of different systems. Besides these communication interfaces, additional interfaces like two CAN, analog/digital I/Os, or audio can be integrated via the I/O shields. For a wireless data connection, options for LTE/UMTS/GPS and WLAN are available. According to the company, even full customer specific I/Os can be implemented without developing the complete box from the beginning. In this system a TPM chip is implemented which can be used for licensing and manipulation protection. This industrial PC was designed for maximum reliability during 24/7 operation and long term availability, says B-Plus. The operation and service cost are minimized due to a maintenance-free design, the company adds. On the one hand there are no moving parts, like fans or hard discs, on the other hand no battery is built in. The real time clock in this device keeps the time with a goldcap. A battery change is no longer necessary and the export of the devices is simplified. For mass storage extension there are 2,5-inch SATA SSD or M.2 SATA SD available with capacities of 32 GiB to 1 TiB. The operating temperature without convection is -40 °C to +60°C and within the Gatebox housing the temperature ranges from -40 °C to +85 °C. The product was shown at the Embedded World 2016.